The Lily 16 has a lightweight aluminum frame, great for when she’s riding it and that ‘rare’ occasion you are carrying it because she’s had too much fun. The single speed drivetrain keeps her focused on perfected braking with the front and rear v-brakes for a smooth, controlled ride. Get your little lady ready to wave bye bye to training wheels and ride like a big girl with the lovely Lily 16. Designed for girls 3 to 6 years old, or 38" to 45" in height, this girls mountain bike-inspired design offers a lightweight frame that is easy to maneuver when she’s riding and light enough for mom or dad to carry on the “rare” occasion that she’s done, or already had too much fun. I purchased this bike for our soon to be 5 year old daughter. I don’t know exactly what I expected but I’m some ways the Lily 16 comes up short. The bottom bracket is very rough and the cranks do not turn smoothly. The wheels are also out of true, and one is out of round. With the wheels being out of true the brakes pulsate when applied - hard for a newer rider to deal with. Otherwise the bike is very nice, good fit and finish on the frame and other components. I’m overall happy but it some of the shortcomings will need to be addressed at additional expense. Great looking bike and a comfortable fit for my daughter, just a little short of the mark mechanically. We got this for our 5 year old daughter. I compared several "serious" kids bikes that had well thought out geometry but for the price the Lily 16 couldn't be beat. 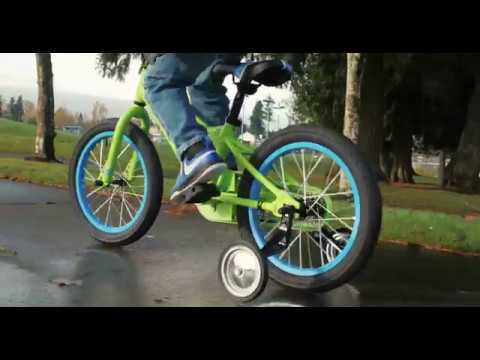 I liked how it had hand brakes instead of coaster brakes which is hard to find in other kids bikes. 16" / Age 3-6 Rider Height 38" - 45"